His Excellency President Bashar Assad blasted the idea of any war in the region and reiterated cling to peace as Syria and Arabs' strategic option. "We in Syria had never been for war neither had viewed in it, whether for us or others, any interest; we do speak of peace hence it is the desire,'' President Assad declared in a recent interview with the French ' Le Figaro'. The president linked development to peace saying '' It was difficult to have genuine development in the region as a whole without reaching to peace; development itself could help the realization of peace. We should work for peace as to contribute to and as to push the process of development forward,''. "We are determined to follow up the process of development in Syria. As for the factor of time, it depends on existing capabilities of local means of development and of other means, we use through our friends,'' added the president. 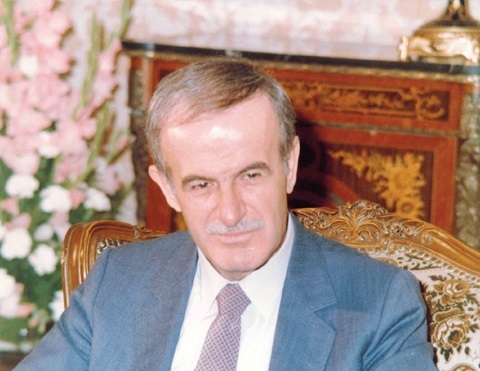 In reply to several questions to this effect, President Assad said that the process of development in Syria is to continue the process initiated by the builder of modern Syria, late president Hafez Assad, '' You develop things existed by your predecessor'' noting that this ongoing process in Syria does benefit by the enthusiasm of the youth and by the wisdom and direction of the old. "There are certain things realized in the country since coming to the presidency; however, there are other things which weren't realized as we did wish; at the same time, there are things realized better than what we expected,'' underlined the president. His Excellency touched upon all different aspects of the Syrian life asserting '' conditions in Syria go in a satisfactory form'' noting that several measures would be taken as to deter the reasons behind crimes commitment speaking of a continued determination to pursuer the march of the late president, who on different occasions set prisoners free. His Excellency President Bashar Assad underlined that the realization of just and comprehensive peace in the region would pave the way for recognition, and for normal relations with Israel. "Once Israel was to be able to offer genuine peace, a just and balanced peace deal was to be signed, there would be a recognition of Israel,'' President Assad said in a special interview with the French television on June 16th, 2001, prior to his forthcoming trip to Paris. in reply to a question on the possibility of signing a peace agreement with the Israeli Premier, Sharon, the President said " never view the agreement as the objective, the objective is the very peace; the reality whereas the agreement is one of the means for the realization of peace,''. "If the said means were to be just, there would be a just peace; there are certain bases for the process of peace,'' the President added asserting that Syria searches for real and just peace not for deformed agreements citing examples of such failures by others in the past. 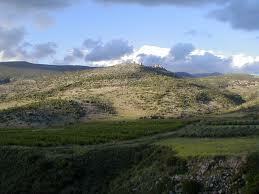 "We want the Golan, the Syrian land. Syria puts no conditions for this hence the Golan was but her own right,'' added the president reiterating that this very right was enshrined, acknowledged and unanimously agreed upon through the related UN resolutions, Madrid Terms of Reference, by every member of the world community save the Israeli side. "Not a single day passes without the Syrians talk of and work for peace; this is our aim, this very aim is the hope where all of us have interest in lasting and genuine peace" the president said asserting '' I believe, sooner or later, there would be peace and stability,''. Pres. 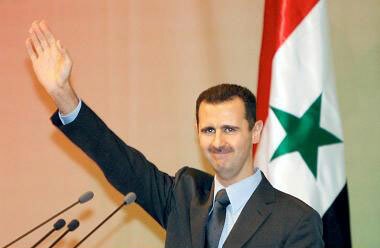 Bashar Assad "We are a basic part of the solution; it was not possible to isolate Syria. I think what has changed is not Syria's stance… our stances are firm... What has been changed is the others' understanding to the importance of Syria," President Assad told France TV 2 and 5 .
" 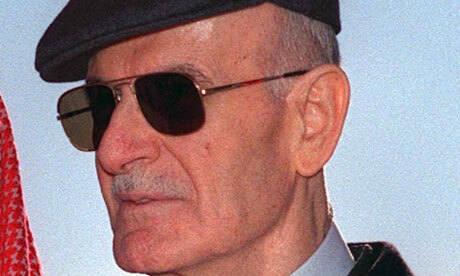 On French Pres.Jacques Chirac accusation of Syria regarding Hariri assassination, President Assad underlined " it is not possible for a person in the level of president to accuse anyone without evidences… whom he wants to accuse Syria, whether he is Pres. Chirac or any other person, he should give evidence… relations among countries should be built on realities and interests not on personal emotions." "Any solution in Lebanon that won't take into consideration the Lebanese consensus means instability in Lebanon, we should find the common factors which realize consensus, at that time, we can play a role, not pressure, I don't like the word pressures, I'd like dialogue… as we did with the Palestinians, we held dialogue without any pressures," Pres. Assad noted. On the President's response if the court referred to any Syrian relation to Hariri assassination, he said "this needs evidence... I previously said that any person who might be involved in this matter is considered a traitor on the national level and within the Syria law… This person will be tried by a Syrian court and his punishment will be greater than any sentence issued by another court, But we will not abandon our sovereignty in this subject." On UN report about weapon smuggling to Lebanon particularly to Hizbullah, Pres. 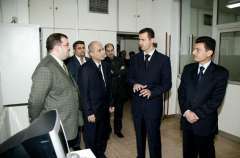 Assad said that "this accusation is rejected, saying that the European intelligence is existed in Lebanon with their Lebanese allies, so where are the evidences?" The president added that " Hizbullah announced, before and after war, that it has big capabilities and it is not necessary for them have arms. What happens is running away from the basic problem…they have to work towards the solution of peace in the Middle East before they talk about missile or thousands of missiles by any side or organization in our region". Answering a question on deployment of any UN forces along the Syrian-Lebanese borders, the President indicated that "we announced that we reject any deployment of international forces because this means "war announcement" .We agreed on technical cooperation with sides in this regard, many of the European states proposed this issue which is monitoring the Syrian –Lebanese borders. Syrian President Bashar Assad discusses initial stabs at democracy in his country, the outlook for peace in the Middle East and Syria's withdrawal from Lebanon. 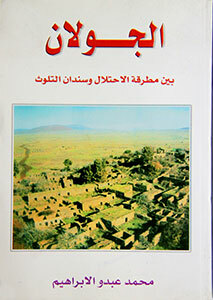 Assad: Well, it just happens that the Arab states develop at different rates and under different historical conditions. Egypt, for example, has not experienced as many coups as Syria. Besides, Cairo signed a peace treaty with Israel, whereas we remain in neither a state of war nor a state of peace with Israel. Incidentally, our development only began a few years ago, so of course expectations will vary widely. But the main issue is that we in Syria have at least opened up a dialogue about it. SPIEGEL: But it's taking longer than many would like. 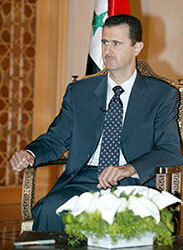 Assad: The pace of our development depends upon the challenges that we must face, which we cannot always influence. For example, we have to deal with foreign powers meddling in our internal affairs. Assad: The more meddling there is, the slower the pace of development in Syria. After all, the democratic process should pervade the entire country. Naturally, the unresolved Middle East conflict also slows down development. And then there is the question of what should be our greatest priority -- political development or economic growth. Assad: There is a tremendous gulf between the two objectives. To promote growth, we urgently need help from the European Union. For many of the Syrians I meet, poverty is a far greater concern than the outlook for a democratic constitution. Besides, there is also terrorism, which stands in the way of democratic development. We simply have to act as quickly as possible to keep things moving forward. SPIEGEL: But you don't exactly make it easy for your fellow Syrians. Political parties are permitted, but they are immediately prohibited as soon as they form, while members of the opposition are arrested. 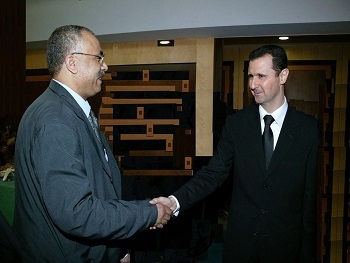 Assad: But you've been talking to opposition leaders in our country. If we were to arrest them all, there wouldn't be enough space in our prisons. SPIEGEL: Most members of the opposition with whom we spoke have spent many years in prison. Assad: But now they're out again. You can't simply equate the situation in the West with the situation in our country. Take religion, for example. In Great Britain, an author published a book in which he claimed that Jesus Christ had children. Such statements don't trigger civil unrest and bloodshed in Europe. But write similar statements about Islam in Syria and you might see bloody uprisings.